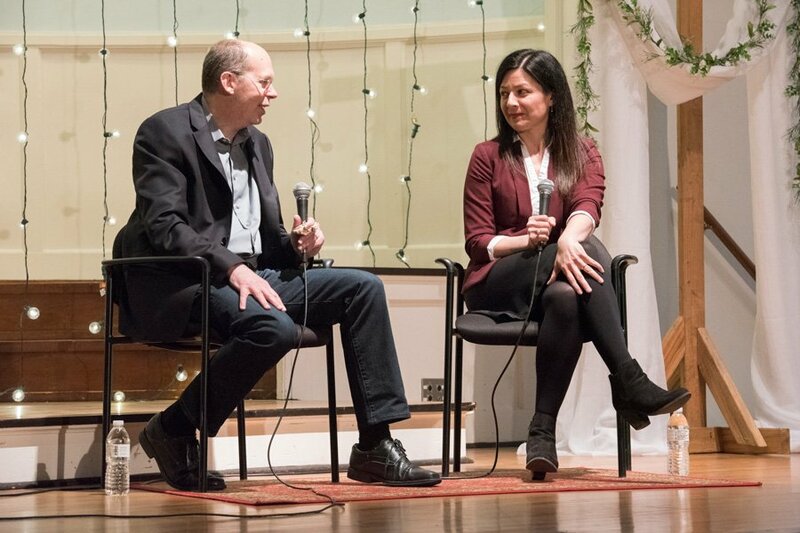 Medill Prof. Alex Kotlowitz and philosophy Prof. Jennifer Lackey talk at an Evanston Literary Festival event on Tuesday. The two professors worked together on a project to help prisoners tell their stories. Two Northwestern professors, who set out to help prisoners tell their stories, shared their work Tuesday night at an Evanston Literary Festival event. Medill Prof. Alex Kotlowitz and philosophy Prof. Jennifer Lackey discussed their project, “Written Inside,” at Sojourner Covenant Church, 1101 Church St., in front of an audience of about 20 people. The project features stories written by prisoners in Lackey’s class at Stateville Correctional Center about ordinary life in prison. Lackey has taught inmates at Stateville — a maximum security prison located in Crest Hill, Illinois — for two years. The project was born in February 2016 when Lackey was teaching a 10-month course at the prison on mass incarceration. Lackey said for many of her students, it was their first sustained engagement with the issue in an academic setting. As part of the course, Lackey invited several people to speak to the prisoners, including Kotlowitz. While Kotlowitz had initially come to discuss one of his books, he was inspired by the results of a 10-minute writing exercise in which he asked the prisoners to write about their cells. Kotlowitz began a year-long creative writing workshop with Lackey’s class of 15 students, most of whom were serving life sentences for violent crimes. Though a few dropped out of the project, most of the prisoners finished, Kotlowitz said. The finished stories were published online in The New Yorker and were adapted for radio by WBEZ Chicago. The inmates’ work was narrated by professional actors, as bringing recording equipment into a maximum security prison presented a serious challenge, Kotlowitz said. Lackey said writing holds tremendous meaning for her students, many of whom have been behind bars since they were teenagers. She said she hopes to expand NU’s engagement with Stateville into a four-year degree program through the School of Professional Studies. The talk was organized as part of the Evanston Literary Festival, a two-week-long series of speakers and workshops that “celebrates the literary culture of Evanston,” according to the festival’s website. John Wilson, a co-organizer of the festival, told The Daily he saw the event as an opportunity for Evanston residents and NU students to learn more about education in prison. Medill junior Hannah Johnson, who attended the event, told The Daily she appreciated the way Kotlowitz and Lackey’s work offered a window into a system that many Americans would prefer not to think about.